11 74290-2129 - Saddle Bag . 36 74290-4419 - Battery Retainer . 23 74290-9289 - Headlight Assembly. 21 74290-9029 - Handlebar Set (banded). 14 74290-214A - Gas Tank. 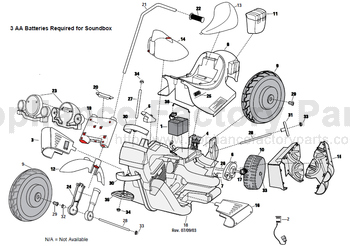 15 74290-9169 - Exhaust Set (banded). 24 74290-9329 - Shock Set (banded). 30 74290-2359 - Bushing (steering). 31 74290-2379 - Bushing (axle/silver). 35 74290-2369 - Steering Stop. 34 0801-0604 - .354 Black Retainer/cap Nut. 0912-8001 - #8 X 3/4 Inch Screw. 74290-9259B - Small Parts Bag. 74290-9249 - Large Parts Bag.